While introducing new legislation aimed at tightening up border security Thursday morning, Sen. John Cornyn, R-Texas, called President Trump "an ally" in fighting illegal immigration. "We just happen to have, thank goodness, a president who believes that border security is important, and so we view him as an ally in this effort," Cornyn said at a news conference introducing the Building America's Trust Act. The bill aims to increase law enforcement resources and add "infrastructure, like a wall system," along the southern border, according to Cornyn. "This isn't a pretend border security bill, this is a tough border security and interior enforcement bill, and we intended it that way," Cornyn said. Wednesday morning, Mr. Trump endorsed a bill with a similar objective. The RAISE Act, introduced by Sens. Tom Cotton, R-Arkansas, and David Perdue, R-Georgia, aims to drastically reduce the number of immigrants entering the United States by establishing a merit-based points system for allowing immigrants into the country. 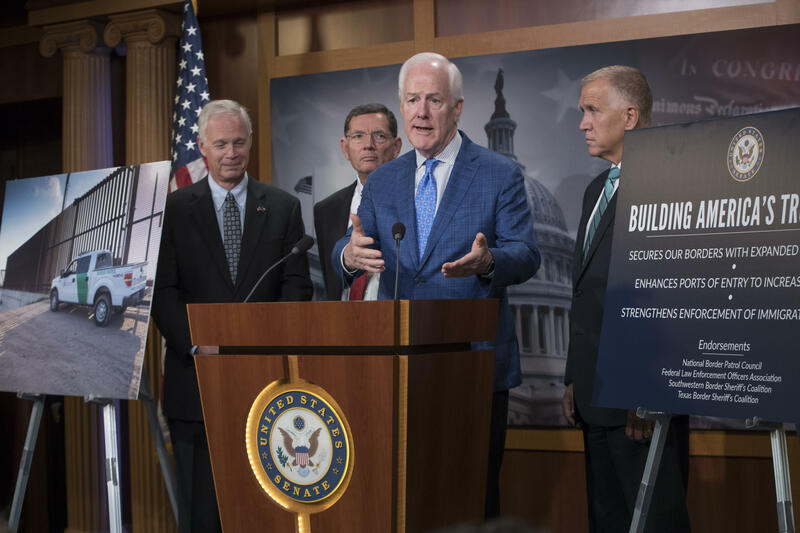 "We aren't just securing our borders for tomorrow, but we're looking ahead and locking in a framework that will last into the future," Cornyn said of the Building America's Trust Act. If passed, the bill would authorize $15 billion in funding to go toward border security efforts over the next four years. Cornyn would not confirm if funding for the infrastructure portion of the bill would fall under Mr. Trump's promises that "Mexico will pay for the wall." "We are members of Congress, and we are used to Congress appropriating the money," Cornyn said. "And we'll leave it to the president and his plan for how we recoup that at some point." While increasing physical infrastructure along the southern border, the legislation also reinforces existing border security laws by requiring Department of Homeland Security officials to consult with local border authorities and ending catch and release through enacting "Kate's Law." In June, the House passed "Kate's Law," which imposes tougher prison sentences on undocumented immigrants with "a serious criminal record" who have previously been deported and re-enter the United States. "Today we're sending the message that we will defend our borders, we will enforce our immigration laws and we will deter illegal immigration," said Sen. John Barrasso, R-Wyoming, a co-sponsor of the bill. The bill also holds sanctuary cities "accountable" through its provisions, which allow the federal government to withhold funding and grants from local governments who fail to comply with illegal immigration enforcement. Sanctuary cities offer safe haven to undocumented immigrants who may otherwise be deported by federal immigration officials. "My definition of a sanctuary city is a city that does not cooperate with federal law enforcement authorities," Cornyn said. In an effort to garner bipartisan support for the bill, co-sponsor Sen. Thom Tillis, R-North Carolina, referenced the deaths resulting from illegal southern border crossing efforts. "If you're against the wall, if you're in the group of people that think we need bridges not borders, think about the humanitarian crisis that will continue if we don't increase situational awareness and operational control down there," Tillis said.